2. Put the paste in a stand mixer with paddle attachment and stir on low to cool dough. Mix about 3-4min. once dough is not super-hot, add in salt, then add one egg at a time. Making sure to remove the stringy part of the egg with tweezers before adding them. Mix after each egg is added. 4. Flip a half sheet over and line with a silicone mat. Run cool water over the mat, then pipe 2 inch circles of dough on the sheet. Brush the dough with an egg wash and press down the tips with the brush. 5. Bake at 425 degrees Fahrenheit (218 degrees Celsius) for 10 min then decrease to 350 (190 degrees Celsius) for 18-23 min. Leave the oven open for a min. 6. 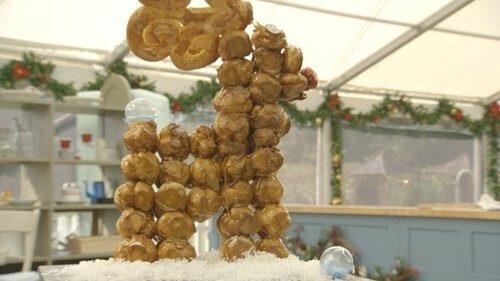 Pop dough out and pierce choux with wooden skewers to dry out inside about 5 min. 7. In a pot add milk and bananas, bring to a boil, then set to side to let flavor develop. At least 30 min. 8. After 30 min. In another bowl mix eggs, sugar, corn starch, salt and paste until there are no lumps. 9. Strain milk through a fine strainer to catch all bananas. Measure out 4 cups of milk. And bring it back to a simmer. 10. Stir a little milk in to egg mixture to temper. Add a little more. Then add the egg mixture into the milk mixture and whisk. Whisk over med heat until thick. At end add extract and paste. 11. Pour mixture through strainer. Add 2 cups of the bananas chunks and puree with the milk to equal four cups total. 12. Add to stand mixer and mix on low until cool. Put plastic wrap down on top of the cream and put in fridge until cool. 14. In a shallow saucepan, add sugar water and lemon extract stir to combine. Cover and cook over medium heat until sugar turns light amber (15–20 minutes). Remove from heat. Reheat caramel until liquid again if it becomes too thick. 15. 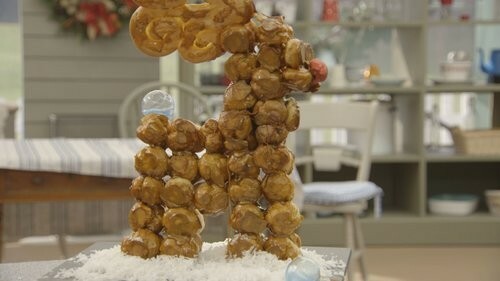 Using tongs dip the round side of each choux into caramel place them in the shape of a reindeer.